Performs the building energy diagnosis according to both CEI EN 16247 and ISO 52016 hourly dynamic method. It quickly evaluates energy retrofit actions estimating the economic opportunity and the final annual savings. It defines the energy balance adapted to the users, starting from the real consumption data and allows the economic evaluation according to the LCCA approach (EN 15459). The right tool to carry out the energy project of residential and non-residential buildings. It calculates the project powers and the energy performance of new and existing buildings, performs the legal checks for housing and plant, the nZEB project requirements. Empowered by the ISO 52016 hourly dynamic solver, it calculates the internal operating temperature and determines power and hourly requirement starting from the energy model of the building, depending on the climate and the occupational profiles defined. In 2016, Logical Soft entered into a research contract with the Department of Architecture, Built Environment and Construction Engineering (ABC) of Politecnico di Milano to provide technical-scientific support in the implementation of the hourly dynamic calculation model proposed by ISO 52016:2017 Standard in TERMOLOG Software. The research core objective was to realize a simplified hourly calculation solver based on an equivalent resistive-capacitive model (R-C) according to the Crank-Nicholson scheme. To achieve this goal a new calculation engine in TERMOLOG software has been developed and validated according to ISO 52016 and to ANSI/ASHRAE 140-2017 "Standard Method of Test for the Evaluation of Building Energy Analysis Computer Programs and in the Building Energy Simulation Test (BESTEST) and Diagnostic Method", an internationally recognized methodology for comparing the results of energetic simulations of buildings in a dynamic calculation. TERMOLOG is the first hourly dynamic calculation software developed according to ISO 52016 and is fully MADE IN ITALY. It accurately predicts energy performance of private dwellings, residential and non-residential buildings taking into accounts real use and boundary conditions and respecting time requirements of building projects. TERMOLOG provides a fully-integrated graphical 3D interface and a set of high-productivity tools for building design, energy performance analysis and predictive energy savings. The energy model obtained represents all relevant building parameters with high accuracy: no further simplification is required. Calculations are completed in an extraordinary short time. TERMOLOG includes modelling, solver and post-processing solutions. It provides a friendly graphical interface, hourly dynamic simulation engine, wide libraries of materials, components, standard HVAC equipment, renewable energy and emerging technologies. It can be used by any engineer, architect or ESCO. Beginners and students can learn and use TERMOLOG in a few hours. The software provides plenty of reports, spanning from energy costs, predictive savings, monthly summaries, annual results, histograms to raw data in .xls format. TERMOLOG is the easiest approach to energy design and the best option to meet today's challenges, such as saving energy, minimizing costs and improving occupant comfort. TERMOLOG offers designers a competitive tool to perform hourly dynamic simulation in every project such as private dwellings, large buildings, new construction or existing building retrofit. They can accurately and rapidly simulate energy performance, understand the impact of their design decisions and project buildings to meet both high energy performance standards and occupant comfort. TERMOLOG delivers powerful tools to perform the building energy diagnosis according to CEI EN 16247. 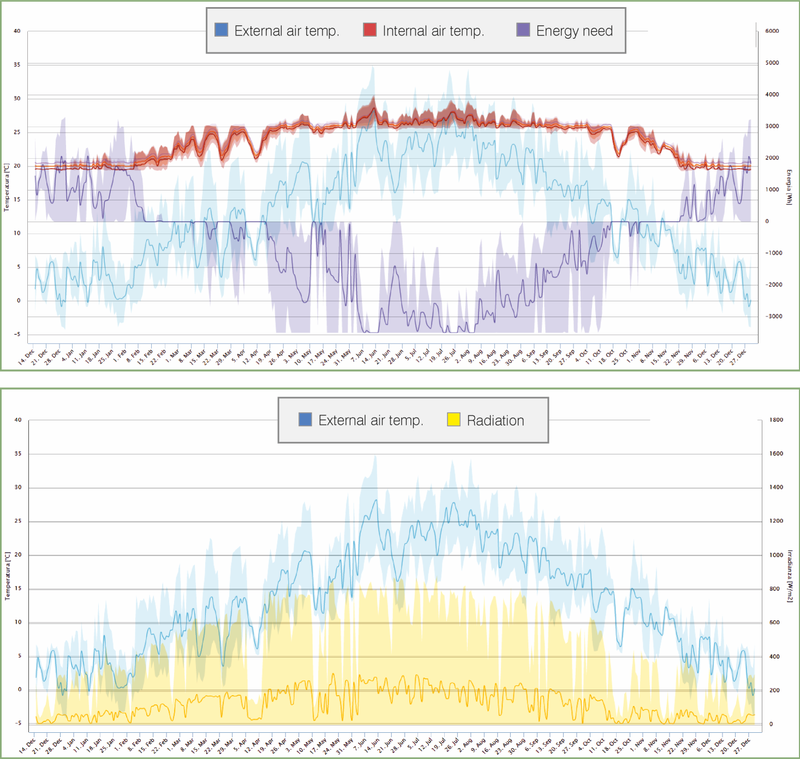 You calculate the energy balance adapted to the user (tailored rating) in its real boundary conditions, considering consumption, temperatures and usage profiles, invoices and energy bills. The software determines the actual fuel consumption and helps you understand the building defects and their causes. TERMOLOG makes a comparison among possible retrofit solutions using powerful costs and benefits benchmarking techniques and helps you choose the best solution to improve building energy efficiency. Retrofit measures aim at enhancing the energy efficiency and the environmental impact of buildings but they can also be an economic opportunity. The economic analysis in TERMOLOG is carried out according to the LCCA (Life Cycle Cost Analysis) method of the EN 15459. TERMOLOG shows you possible retrofit scenario with full details of maintenance and disposal costs, periodic and one-off costs, the service life of individual components and any incentive available. TERMOLOG shows the cash flow trend, calculates VAN and Profit Index and predicts the convenience of retrofit actions.